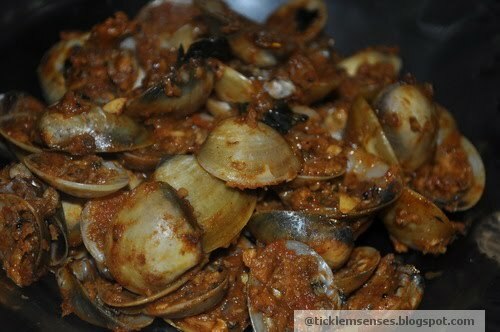 Cockles/Clams or Khubbe in Konkani are a popular type of edible shellfish in Mangalore. They are available in 3 varieties ie. Khubbe,Tisre or Kalva. They are collected by raking them from the sands at low tide. Whenever we go to hubby's estate we try to sneak a trip to the neighbouring village where we can go cockle picking at low tide :) It is good fun as we have a large group of adults and children on their knees shovelling through the sands with their fingers or shovels looking for cockles, and competing on who can collect the most amount of cockles. Only the big cockles are selected as they are meatier. These cockles are then taken home in a bucket of water, rinsed well and soaked in a bucket of fresh clean water for a few hours to allow all the sand within the cockles to be let out. After a few hours the cockles are opened using a traditional adhalo ( a tool with a wooden seat and a iron sickle at one end) meat is collected onto one shell and the empty shell is thrown away. There are many ways of preparing cockles. Either in a dry style with a simple array of spices and coconut as in this recipe called "Khubbe Sukke" meaning 'cockles in a dry spicy coconut masala' or served as "Khubbe Mutlees" where 'cockles are cooked in a spicy rich coconut gravy with rice dumplings' (mutlees). Mom prepared this Sukke dish for us on our recent trip home it was awesome. Served along with daaliso saar and plain rice. It is simply delicious. 3. Heat oil in a large vessel, add crushed garlic flakes, once it browns add mustard seeds and curry leaves. Once the seeds crackle add the ground masala paste and coconut, fry well for 5 minutes. 4. Add the cleaned opened cockles and stir well to allow masala to coat the cockles, if its very dry add 2 -3 tbsps water. Close the vessel and cook for 10 mins. 5. After 10 minutes open vessel taste for salt. Cockles are quite salty on their own so taste before adding any extra salt. Serve hot along with congee ( ricecooked and served in its water) or plain rice and daalisosaar. I add a little may be one spoon coriander or dhania to the mixture of coconut and red chillies, while grinding.. its amazing to taste..
thankyou for stopping by and leaving me your lovely comment. I hope you do visit often and find recipes here that you will treasure:) Thankyou. Peace.